1What can be said that is new about Eugene Delacroix’s famous trip to Morocco in 1832 with the diplomatic envoy of the Comte de Mornay sent to finalize a treaty with Sultan Abd er-Rahman? Following on investigations of the new scholarship of the last fifteen years since the bicentennial of his birth in 1998 and particularly the work of Maurice Arama, Albert Boime, Michèle Hannoosh, Barthélemy Jobert, and Arlette Sérullaz, this essay focuses on the personal relationships, often with less well-known figures, that the French artist made during his time in North Africa. These recent studies, taken as a whole, have revealed a more nuanced image of Delacroix. Through these new perspectives it seems that, despite his Orientalism, Delacroix discovered and reconstructed « a world of tolerance » as described by Arama, which, to a certain degree, was not wholly Orientalist, despite strategic inclusions and absences, i.e. the active presence of the non-dit. 2First, Delacroix discovered the Jews of North Africa, something that he hardly knew. And then he realized that they cohabitated with the Arabs. Not on equal footing of course, but they lived together according to certain limits. For example, the Jews were required to remove their shoes when they walked near a mosque, etc. Noting much of this, Delacroix transformed what he saw in North Africa through his sketches and his grand paintings. Focused on this personal approach, this essay will re-examine the process by which the artist transcended a purely Orientalist vision by connecting with individuals at certain moments. Through his personal relationships he confronted different cultures differently, and therefore represented them differently than did many of his contemporaries, particularly with regard to the roles of women. So, given this dynamic of personalization and co-existence, who were the principle characters of his voyage who shaped his vision both virtual and physical? These figures include Charles-Henri Delacroix, Charles de Mornay, Jacques-Denis Delaporte, William Auriol Drummond-Hay and his family, Abraham ben Chimol and his family, Mohammed ben Abou, and Victor Poirel and his family. 3Before leaving for North Africa, Delacroix had dreamed of an «Orient imaginaire,» that is to say a vision of Napoleonic military exploits. For Delacroix the dream of the East began with the stories of Charles-Henri Delacroix (1779-1845), Delacroix’s oldest brother and a war hero in Napoleon’s armies. Thanks to the legacy of their father, the Minister of Foreign Affairs under Napoleon, the young Delacroix boys had heard the family stories of the glorious Empire. As the younger Delacroix once said, «…et si je n’ai pas vaincu pour la patrie, au moins peindrai-je pour elle...»2 In the mythologies of grand armies, Eugene, like Stendhal, revered the Napoleonic glory in comparison with the monotony of their contemporary existence as they perceived it. 4The voyage to North Africa in 1832 offered the artist the opportunity to recreate a Napoleonic expedition anew, something that he had dreamed of early in his youth.3 As soon as he arrived in Morocco, he wrote, «Je suis dans ce moment comme un homme qui rêve et qui’il craint de voir lui échapper…»4 In his Napoleonic fantasy, Delacroix had exchanged the modern world for an «antiquité vivante.» He had found a classical world which overturned his contemporary one. Thus his understanding of the Maghreb already represented several layers of its existence and thanks to that he was able to see a world that was both changing and unchanged. In this sense, through his search for Antiquity, his Napoleonic fantasy, and his expressed doubts about French colonialism, we begin to see that his perspectives were not always strictly Orientalist in nature. 5These stories of military bravery were perhaps equaled only by the nostalgia for a lost dramatic youth which Delacroix felt as a young man. Nonetheless the opportunity to recast that lot came not from the battlefield, but from the stage. Delacroix was first invited to join the expedition to Morocco by Henri Duponchel, a friend from Pierre Guérin’s atelier and later, director of the Paris Opera. Duponchel himself had been asked by his lover, the celebrated Mademoiselle Mars (Anne-Françoise Salvetat, 1779-1847), to include Delacroix. Theater compensated for an almost lost reality. 6Who commanded the voyage? The Count de Mornay (1803-1878) led the expedition from January to July 1832. His French translator of Arabic was Antoine-Jerome Desgranges (who enjoyed smoking cigars with Delacroix). Desgranges was not particularly competent with the Arabic spoken in Morocco, nor could the Moroccans understand him very well either. De Mornay, ever suspicious of the locals, wanted to keep Desgranges at his side at all times, but soon after their arrival in Tangier, it was necessary to call the Jewish interpreter, Abraham ben Chimol, from the Maison de France «en cas d’urgence.» Ben Chimol’s personal participation in the sojourn was to be so vital for Delacroix. 5 Hannoosh (M.), Eugène Delacroix : Journal, José Corti, Paris, 2009, pp. 277-278. 7 Ibid. p. 69, note 12. 8 Arama, Voyage intiatique, p. 16. 10 Hannoosh, op. cit., vol. I, pp. 277 and 285-286. 11 Joubin, op. cit., vol. I, p. 311, 8 février 1832. 12 Hannoosh, op. cit., vol. I, p. 212. 13 Joubin, op. cit., vol. I, p. 318. 14 Hannoosh, op. cit., vol. I, p. 211. 12Delacroix tells us in his journal that he had toured Tangier several times with Sir Drummond-Hay and had asked him questions about Arabian horses in particular.11 Later in his Journal of March 2, he recalled, «Promenade avec M. Hay. Dîné chez lui le soir...»12 Drummond-Hay’s twenty-year old daughter, Louise, seems to have intrigued the French artist—aged thirty-three—and on February 29, 1832 he makes a confession. Once again writing to his friend Pierret, the artist admitted to «un petit amour sentimental que je file ici avec une très jolie et décente petite Anglaise.»13 Given the strict rules regarding women in the Islamic world, and given his own personal character, Delacroix seems to have become enamored of her and even gave her a drawing signed on February 21, « Chez M. Hay le soir. Donné à sa fille le dessin de femme maure assise…»14 His first visions of the Moroccan landscape were certainly viewed from their residence where he had spent a lot of time: « la terrasse du Consul anglais. dessiné la vue de la ville de chez lui… » (such as the watercolor, «View of Tangier,» Musée du Louvre, Paris). 13The son, John Drummond-Hay (1816-1893), who was sixteen years old when Delacroix visited their house in Tangier, published a book in 1844 about his own life in Morocco. In his personal account he gave descriptions of the countryside in Morocco and made a very detailed commentary on the thunderous, equestrian ritual, the fantasia. One can imagine that this kind of fascinating scene, viewed by Delacroix several times on the trip from Tangier to Meknes, was discussed at the house of the «good consuls,» the Drummond-Hays, even before the artist actually saw it for himself. 14But the personages the closest to Delacroix during his voyage to Morocco were a Jewish man, Abraham ben Chimol, and an Arab man, Mohammed ben Abou. 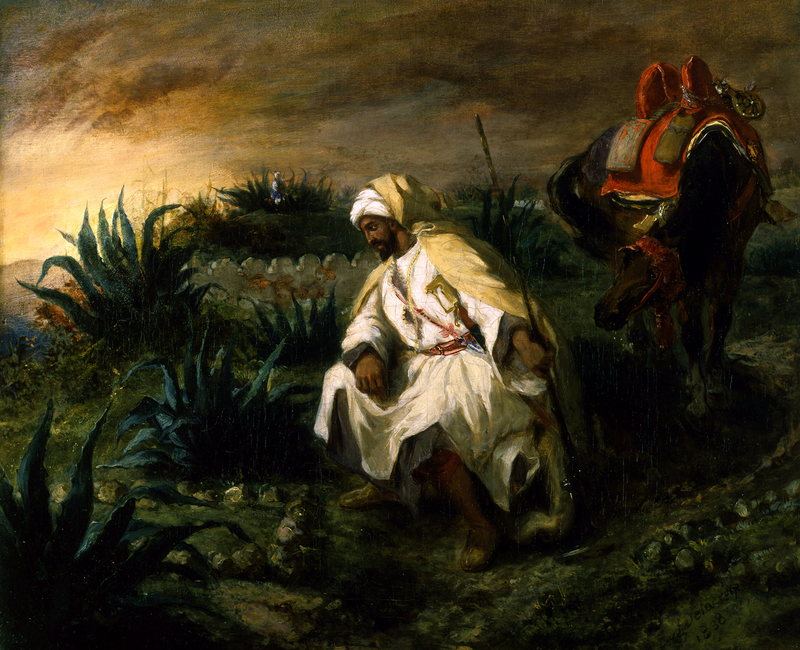 These men Delacroix saw almost every day while he was in Morocco and through them he saw the exotic world around him in a much more personal way. For Delacroix the immediate effect of these personal relationships transformed or at least modified the Orientalist vision of Morocco which most Europeans embraced and which permanently affixed the Other in the exotic past. 15 Salon catalogue, 1841, no. 511; cited by Johnson, op. cit., vol. III, p. 176. 16 Arama, Voyage intiatique, pp. 122-123. 17Delacroix had a decidedly different view given the open door chez les Ben Chimols which conveniently included the possibility of drawing some « compliant » Jewish models. 19 Hannoosh, op. cit., vol. I, p. 321. 22 Arama, Voyage initiatique, p. 146, note 12. 23 Hannoosh, op. cit., vol. I, p. 306. 27 Arama, Voyage initiatique, pp. 122-123. 28 Beaumont-Maillet et al., op. cit., p. 146. 22For him they were “les perles d’Eden,” a perception perhaps equally Orientalist, but clearly more empathetic. 29 Arama, Voyage initiatique, p. 102. 23Maurice Arama has brilliantly pointed out that in Delacroix’s painting, A Street in Tangier (1832, Albright-Knox Gallery), represents a world of unexpected tolerance revealed in the scene identified by Arama as a street in Tangier and not Meknes. 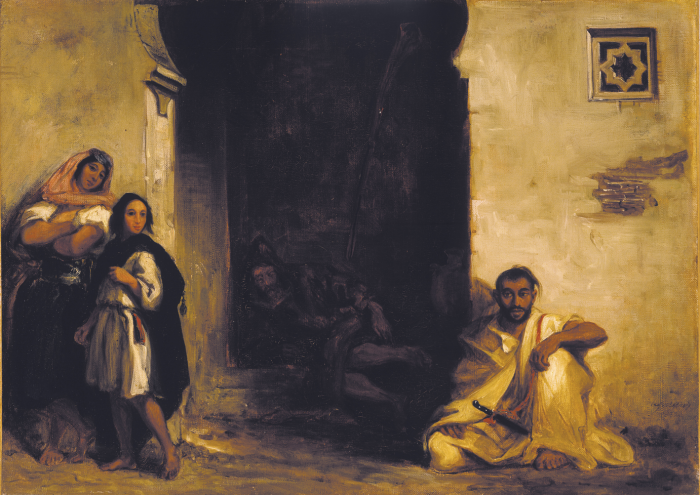 The scene includes a Rifian (an indigenous Berber in white burnous), an Arab at the door, and a Jewess and her child at the extreme left. As Arama has documented, the polygonal star is similar to one found in Tangier (i.e. the Hindu Star of Lakshmi, with its eight forms of riches). The model for the Rifian was a bodyguard at the Consulate of France and the woman (Preciada) was the wife of Abraham ben Chimol.29 The presence of the child unambiguously establishes the proper moral standing of the barefooted woman. Arama has shown that Delacroix would never portray a Jewish woman alone instead representing her in fact as a very discreet lady and not a woman of the street. In short the painting, as Arama unveils it, represents a utopian world or at least one of some tolerance (Rifian-Arab-Jew-Hindu). 30 Joubin, op. cit., vol. I, p. 315. 24Delacroix wrote to Henri Duponchel on February 23, « Les juives sont très-bien aussi et leur costume est très-pittoresque. J’ai assisté à plusieurs cérémonies; il y a à faire des tableaux à chaque coin de rue.»30 Later he dedicated one of his sketchbooks – now found in Chantilly – to Jewish women. In these details of the everyday life of the Jews of Morocco and the relationship between the Jews and the Arabs he reconstructed a vision of the Jews of the Orient just as he would for Arabs of North Africa. In both instances, he would do this primarily through personal relationships. But there remained a daunting challenge for him with the Arabs: there was no or little access to Arab women! 25Kaid Sidi Mohammed ben Abou ben Abdelmalek (c. 1775?-1858?) was the commander of the Moroccan cavalry who was the overseer of the French expedition from Tangier to Meknes where they were to have an official audience with the Sultan. This three-month expedition required 200 soldiers armed to the teeth and was comprised of both French and Moroccan delegations. After their departure for Meknes, it seems that Delacroix was constantly in the presence of the Kaid. The artist made more images of Ben Abou than of any other single person on the entire trip, a witness to the hours and respect which Delacroix reserved for him. At the very least there are some eight paintings and nine prints, watercolors, and drawings which include the Kaid! 31 Hannoosh, op. cit., vol. I, p. 306. 34 Drummond-Hay (J. ), A Memoir of Sir John Drummond-Hay, J. Murray, London, 1896, pp. 185-186. 35 Hannoosh, op. cit., vol. I, p. 228. 27To be sure, there were language difficulties between Delacroix and Ben Abou because the official translator, Antoine Desgranges, was not capable of understanding nor trusting the Kaid. One also doubts that the Kaid spoke much French given that he could not pronounce the name « Delacroix » even after having written it on a piece of paper.35 Nevertheless, the challenge of verbal communication did not keep the soldier and the artist from meeting almost daily, even during those first days in Tangier. 36 Johnson, op. cit., vol. III, p. 174. 37 Drummond-Hay, op. cit., p. 185. 38 Johnson, op. cit., vol. III, p. 172. 39 Hannoosh, op. cit., vol. I, pp. 294-295. « Le vendredi, nous voyions…les femmes…strictement voilées, visiter les tombeaux dans la campagne…ces dames se servaient de ce pretext pour conduire très habilement certaines intrigues où la dévotion n’avait point de part. 30Drummond-Hay (father) and Ben Abou knew each other through diplomatic exchanges of course, but their real friendship grew out of their mutual love of horses. When Sir John Drummond-Hay (son) composed his own memoirs in 1896, he devoted a chapter to «Benabu» [sic] in which he included a letter that he had written to his sister (Louisa?) in December 1857. In this letter he spoke of his older Moroccan friend who had fallen on hard times. Drummond-Hay recounts a story that when Ben Abou had been arrested by some political rivals, the old warrior even asked his English friend for help. « Ils doivent concevoir difficilement l’esprit brouillon des chrétiens et leur inquiétude qui les porte aux nouveautés. Nous nous apercevons de mille choses qui manquent à ces gens-ci. Leur ignorance fait leur calme et leur bonheur ; nous-mêmes sommes nous à bout de ce qu’une civilisation plus avancée peut produire ? 49 Salon catalogue, 1845, no. 438; cited by Johnson, op. cit., vol. III, p. 181. 35In the sketch of the scene from 1832-33 (Musée des Beaux Arts, Dijon) the images of Ben Chimol and Ben Abou are shown together with the French as they were when they shared in the joyful co-habitation in the ritual depicted in The Jewish Wedding (1841, Musée du Louvre, Paris). But in both of the final paintings, the French presence has been eliminated revealing a sad truth: this cultural harmony, whatever its imbalances, would not last forever. 52 Djebar, op. cit., pp. 16-17. 54 Arama, Voyage initiatique, pp. 263 ff. 55 Lambert, op. cit., p. 11 and Johnson, op. cit., vol. III, p. 166. 56 Cited by Johnson, op. cit., vol. III, p. 169. 58 Johnson, op. cit., vol. III, p. 176. 59 Le Magasin pittoresque, Paris, janvier 1842; cited by Hannoosh, op. cit., vol. I, p. 322. 61 Boime, op. cit., p. 387. 43What is most telling is that here again, as in the final painting of The Sultan of Morocco (1845, Musée des Augustins, Toulouse) the Frenchmen, including De Mornay, who were present at the ceremony, have been erased from the scene! Another non-dit ! Given that there were Arabs and Jews assembled here together and that Delacroix had been so warmly welcomed by Ben Chimol and instructed by Ben Abou, one sees, according to Albert Boime, a dialectic between romantic exoticism and realism. Here in The Jewish Wedding is found a ritualized space (the choice of the husband is made by the father), a domesticated space, whereas by contrast, The Women of Algiers (1834, Musée du Louvre, Paris) represents a space secretly, but perhaps mythically penetrated and sexualized; one location constructed as a space of harmony and the other a forbidden space! The wedding scene is a space shared by Jews and Arabs, but divided according to gender. The ambiances (unlike the sketches) are idealized and, according to Boime, the painter places himself in the role of the astonished, but slightly condescending scribe who regards the « lascivious » movements of the female dancer with surprise due to the Orientalist presumption of such «mauvais goût» from the European point of view.60 Nevertheless Delacroix is welcomed there by Ben Chimol almost as part of the family. By contrast, for The Women of Algiers it was necessary to call upon the brute force of the French colonial power—which remains invisible—in order to enter. According to Boime, Delacroix, as a «foreign flaneur,» observed and understood at least some of the colonial problems and sympathized with the Arabs and the Jews whom he had met, but at the same time he clearly maintained his masculine, European perspective.61 The Women of Algiers thus is completely different from The Jewish Wedding thanks to and because of the artist’s personal relationships. The access and entry offered by Victor Poirel and the French administration, the colonial power, could indeed force open the door to secret rituals, but it was hardly « une porte overte »! 44A decade later these worlds had been turned upside down. In the painting The Sultan of Morocco, we see the Sultan leaving his palace at Meknes surrounded by his guards and chief officers. Why did Delacroix return in 1841 to his memories of Morocco some ten years or so after his voyage and after his utopian scene, A Street in Tangier of 1832? At that time in the early 1830s, kind messages and lavish gifts had been presented from Louis Philippe to Moulay Abd-er-Rahman who returned the favor. But in the 1840s along with returning to the fantasia paintings, Delacroix begins to reflect on his experiences in North Africa and « la prison de marbre » as he called Meknes. He could show the The Jewish Wedding in 1841 as a scene of tolerance and harmony only by eliminating the Frenchmen who attended the wedding at Ben Chimol’s home, but soon even that construction of a tolerant vision, which had been so ideally represented by A Street in Tangier in 1832, was not longer possible in the unsettled context of the 1840s. During the interim there is a long list of confrontations between France and North Africa including the taking of Algiers in 1830, the seizing of the smalah of the revered Arab resistance leader, Abd el-Kader (May 16, 1843), the bombardment of Tangier (August 6, 1844), the victory of the French at the Battle of Isly (August 14, 1844), the bombardment of Mogador (August 15, 1844), and the demeaning spectacle of the captured tent of the Prince du Maroc in the Tuileries (a subject painted by Karl Girardet in 1845). French forces under the command of General Bugeaud were in hot pursuit of Abd el-Kader by 1842 and eventually captured him in 1847. Personally for Delacroix, the year of 1845 also marked the sad moments that he lost his brother, Charles Delacroix, and his friend, Drummond-Hay, and his own degenerating health obliged him to take the hydrotherapeutic treatments at Eaux-Bonnes in southwestern France. 62 Hannoosh, op. cit., vol. I, p. 320. 63 Johnson, op. cit., vol. III, p. 183. 64 Trapp (F.), The Attainment of Delacroix, Johns Hopkin’s Press, Baltimore and London, 1971, p. 137. 65 Joubin, op. cit., vol. II, p. 233. 46However, beyond these color effects, the painting represents an image of power. As one art historian described it, the Sultan is presented as « the very image of the implacable hostility of an entire culture… »64 The Sultan is presented as a warrior framed with elements of stability and power. At the Salon of 1845, Delacroix’s painting, a symbolic testament to Moroccan power, was placed in the Salon Carré of the Louvre directly opposite an image of colonial subjugation, The Taking of the Smala of Abd-el Kader by Horace Vernet. Soon after the Salon exhibition the painting of the Sultan was exiled to a monastery in Toulouse far from the French capital. Curiously, Delacroix remarked: « Il est bien vrai que ‘l’Empereur du Maroc’ ira à Toulouse; peut-être y est-il déjà. Je ne sais qui a motivé cette décision dont je me réjouis sincèrement. »65 Why? 47The audience with the Sultan was the great official event of the voyage. But during the decades which followed the political relations between the two countries had changed and the painting realized in 1845 (thirteen years later) was greatly modified from the original description. It was no longer possible for Delacroix to « reproduit exactement » the spectacle despite his description in the Salon catalogue. As in the The Jewish Wedding, the French are no longer included. Despite yet another French diplomatic delegation being sent to Morocco in 1835, the hostilities between France and North Africa had exploded. As several scholars have shown, the French, who are included in the sketch (Musée des Beaux Arts, Dijon) at the side of their former allies, are eliminated from the final work, another example of the control of the Salon under Louis-Philippe.66 Equally disturbing is the fact that Abraham ben Chimol is no longer included in the painting or the catalogue because there is no longer any reason to have a translator to communicate the message to and from the French delegation. Of the artist’s closest traveling companions, only Ben Abou remains. 68 Arama, Voyage initiatique, p. 215, note 12. 50One can say that this brief study of the personnages of the voyage permits us to question in new ways how to consider the images so quickly made, sketched, drawn while on horseback along the desert routes or while sitting at a campsite, in the journals which Delacroix carried in his saddlebags. Despite the friendship between Arabs and Jews and the French artist, and even with the translations by Ben Chimol, communication was sometimes difficult, perhaps above all when it concerned specialized questions about equestrian equipment or the objects and rituals of weddings and funerals. 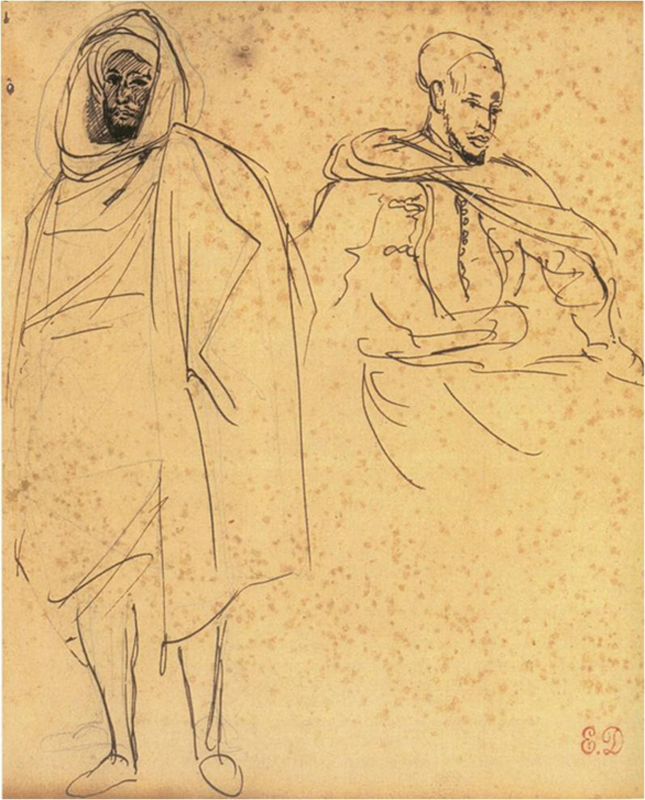 It would seem that these men often communicated more easily with gestures, with drawings on paper and in the sand, and even with actual demonstations during the months that Delacroix spent in Morocco. It is not difficult to imagine that some of the drawings by Delacroix were quickly rendered, awkward, but passionate and personal exchanges of information about the cohabitation of Arab and Jewish cultures. 51How then does one represent an enemy who was once claimed as an ally? Here again we see the dialectic between realistic documentuation and romantic exoticism, the detailed reporting of what Delacroix saw, or at least thought he saw, and the erasure of any reference to the diplomatic mission. Despite his reputation for being melancholic, closed-minded, self-absorbed, and sometimes isolated (« Je mène une vie sauvage, et vois personne »—he once wrote to his friend George Sand around September 25, 1845), the effect and importance of face to face relationships for him is evident in terms of his encounters with other cultures. Despite his tendency to see markers of ethnicity, he remained loyal to both Ben Abou and Ben Chimol. But the question remains: Within the context of Orientalism, what then is the importance of human contact for the integration of cultures? And how can those of us in the West better understand the Arab world as we re-envision the Jewish and Arab world in Morocco and vice-versa? A very important question and one even posed in other terms by Jimmy Carter to Anwar Sadat and Menachem Begin as they talked of their grandchildren in 1978. 52And that brings us to our conclusions. Through the recent scholarship on the work of Delacroix, we have been able to re-envision our perceptions of the world of North Africa through Delacroix’s series of revisions: 1. From his brother and friends, the romantic military dream, 2. From the diplomats, the protocol of official intermediaries, 3. From Abraham ben Chimol, the open door of the Jews, 4. From Mohammed ben Abou, the Arabian horses and Antiquity; and 5. From Victor Poirel, the colonial power…all points of human contact which have the power to transport us not simply to exotic visions of the Other, but to a more empathetic understanding of one another as embodied by Nelson Mandela. Perhaps Rome is no longer in Rome, but humanity is always in humanity, or else we may be only dreaming of a world of tolerance. 2 Dupont (A. ), ed., Eugène Delacroix, Lettres intimes. Correspondance inédite, Gallimard, Paris, 1954, p. 191; cited by Johnson (L.), The Paintings of Eugène Delacroix, vol. I, Oxford University Press, 1981, p. 146. In addition to the works cited here there are a number of important recent studies relacted to Delacroix including those by Sébastien Allard, Darcy Grimaldo-Grigsby, Arlette Sérullaz and Edwart Vignot, Laurence Sigal-Klagsbad, and Beth Wright among others. 3 Athanassoglou-Kallmyer (N.), Prints, Politics, and Satire, 1814-1822, Yale University Press, New Haven, 1991, pp. 11 ff. 4 Joubin (A. ), La Correspondance générale d’Eugène Delacroix, Librairie Plon, Paris, 1936, p. 307, 25 janvier 1832. 6 Arama (M.), Delacroix : Un Voyage intiatique, Editions Non Lieu, Paris, 2006, p. 45. In addition Arama has produced produced an interesting video, Sur les traces d’un judaïsme inconnu, Paris, 2007, which deals with many of these same issues. 9 De Mornay, Correspondance, cited by Arama (M.), Delacroix au Maroc, Institut du Monde Arabe, Paris, 1994, p. 66. 26 Beaumont-Maillet (L.), Jobert (B. ), Join-Lambert (S.), Eugène Delacroix : Souvenirs d’un Voyage au Maroc, Gallimard, Paris, 1999, p. 106. 50 Djebar (A. ), “Ce qu’a vu Delacroix,” Aïssaoui (M.), ed., Le goût d’Alger, Mercure de France, n° l., 2005, pp. 15-18. 51 Lambert (E.), Eugène Delacroix et les Femmes d’Alger, Paris, 1937, p. 11 ; cited by Johnson (L.), op. cit. vol. III, p. 166. 57 See Guibel (A. ), Lisinka Poirel, Album d’une vie, Nancy, 1989 and Arama, Voyage initiatique, pp. 275-276. 60 Boime (A. ), Art in the Age of Counterrevolution, 1815-1848, University of Chicago Press, Chicago, 2004, p. 386. 66 See Olmsted (J. ), “The Sultan’s Authority: Delacroix, Painting, and Politics at the Salon of 1845,” The Art Bulletin, March 2009, pp. 83-106. 67 See Pouillon (F.), presentation for Émir Abd el-Qader & Gl Daumas, Dialogues sur l’hippologie arabe : Les Chevaux du Sahara et les mœurs du désert, Arles, Actes Sud, 2008 and Smith (S.), “Eugène Delacroix : Fantasies y Fantasias arabes,” in González-Alcantud (J.A.) ed., El orientalismo desde el Sur, Anthropos, 156, Barcelona, 2006, pp. 64-73. SMITH, Shaw. New Perspectives on the Voyage of Eugène Delacroix to North Africa: Jews and Arabs Together In : Pratiquer les sciences sociales au Maghreb : Textes pour Driss Mansouri avec un choix de ses articles [en ligne]. Casablanca : Centre Jacques-Berque, 2014 (généré le 18 avril 2019). Disponible sur Internet : <http://books.openedition.org/cjb/640>. ISBN : 9791092046229. DOI : 10.4000/books.cjb.640. Smith, Shaw. “New Perspectives on the Voyage of Eugène Delacroix to North Africa: Jews and Arabs Together”. Almoubaker, Mohamed, et François Pouillon. 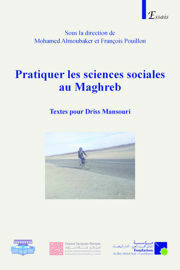 Pratiquer les sciences sociales au Maghreb : Textes pour Driss Mansouri avec un choix de ses articles. Casablanca : Centre Jacques-Berque, 2014. (pp. 267-292) Web. <http://books.openedition.org/cjb/640>. ALMOUBAKER, Mohamed (dir.) ; POUILLON, François (dir.). Pratiquer les sciences sociales au Maghreb : Textes pour Driss Mansouri avec un choix de ses articles. Nouvelle édition [en ligne]. Casablanca : Centre Jacques-Berque, 2014 (généré le 18 avril 2019). Disponible sur Internet : <http://books.openedition.org/cjb/601>. ISBN : 9791092046229. DOI : 10.4000/books.cjb.601. Almoubaker, Mohamed, et François Pouillon, ed. Pratiquer les sciences sociales au Maghreb : Textes pour Driss Mansouri avec un choix de ses articles. Casablanca : Centre Jacques-Berque, 2014. Web. <http://books.openedition.org/cjb/601>.